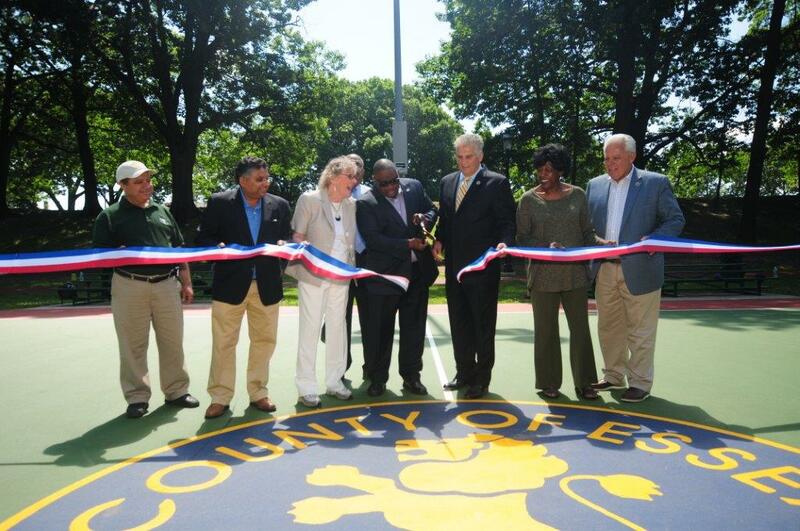 Irvington, NJ – On Wednesday, June 28th, Essex County Executive Joseph N. DiVincenzo, Jr. announced that a project to modernize the basketball courts and walking track and install ornamental pathway lighting throughout the park has been completed. The project is part of the County Executive’s ongoing initiative to ensure park facilities are up to date and able to meet the needs of the community. “Our parks have a vital role in enhancing the quality of life and health of our residents, so it is important that we provide the most up-to-date places to play and exercise. It’s been 13 years since the basketball courts and walking track were improved and it’s time they were updated. The community deserves facilities of which they can be proud,” DiVincenzo said. “The installation of the ornamental lighting will enhance the aesthetics of the park and improve public safety,” he added. “It is becoming a habit meeting the County Executive with all the improvements and activities planned for Irvington Park from the new playground, community center renovations, senior lunch program and now the new basketball courts, walking track and pathway lighting,” Irvington Mayor Tony Vauss said. “Everything the County Executive promised, he has delivered. We couldn’t have a better partnership with the County Executive,” he added. “Anytime we do projects like this it makes me smile, especially in Irvington where I reside. The County Executive has ‘spread the wealth’ to improve all our communities throughout Essex County,” Freeholder Lebby Jones said. “This project is another example of how the County Executive is revitalizing each of our parks. It makes a significant difference in the community,” Freeholder Patricia Sebold said. Both the two basketball courts and running track were upgraded with new surfaces in 2004. Because of regular wear and tear, and significant use, it was necessary to update the facilities. The basketball courts received new surfaces, poles and backboard equipment, and the walking track received a new rubberized surface. In addition, 93 historic ornamental lights were installed throughout the park along the walking paths. The project was designed in-house by the Essex County Department of Public Works, which also monitored the project to ensure delays are avoided. Zenith Construction from Orange was awarded a publicly bid contract for $1,023,663 to perform the construction work. The improvements were being funding through the Essex County Capital Budget. Work started in April and was completed in four months. In 2016, the field house was renovated and renamed as the D. Bilal Beasley Community Center, in memory of the late Freeholder and Irvington Councilman. In 2011, a synthetic grass surface soccer field was installed and three entrances to the park were upgraded. In 2006, a two-story, 2,100-square-foot addition was constructed onto the community center to create more space for the public to meet, storage space and public restrooms. In 2004, the tennis courts, walking track, basketball courts, tennis courts, softball fields and three park entrances were upgraded. In 2003, a rubberized safety surface was installed in the Irvington Park playground and lighting was improved. Essex County has partnered with the Irvington Park Conservancy to obtain funding from the New Jersey Green Acres program and the Essex County Recreation and Open Space Trust Fund. The Essex County Park System was created in 1895 and is the first county park system established in the United States. The Park System consists of more than 6,000 acres and has 23 parks, five reservations, an environmental center, a zoo, Treetop Adventure Course, ice skating rink, roller skating rink, three public golf courses, golf driving range, two miniature golf courses, three off-leash dog facilities, a castle and the Presby Memorial Iris Gardens. Irvington Park is 24.38 acres and is the 12th largest park in the Essex County system. Land for the park was purchased in 1906 and improvements to the site were completed in 1913.